The Economist have boosted the normal Airpoints Dollars earn rate on print and/or digital subscriptions until 31 May. For example, when you purchase a 3-year print and digital subscription to The Economist, you’ll earn a whopping 1,150 Airpoints Dollars—this is one of the best opportunities that I’ve seen to earn a very high number of Airpoints Dollars all at once, without stepping foot on a plane. I’ve reviewed the offer below to show what subscription type and duration is best, based on the effective Airpoints Dollars rebate you’d receive for your spend. According to the terms and conditions, this offer is for first-time subscribers only. The number of Airpoints Dollars you’ll earn depends on the subscription type, and duration. I have listed all the different subscription types, lengths and costs below, and have sorted from highest to lowest the effective rebate you’ll receive in Airpoints Dollars. As you can see, a 1-year print and digital subscription offers the greatest return vs spend amount. 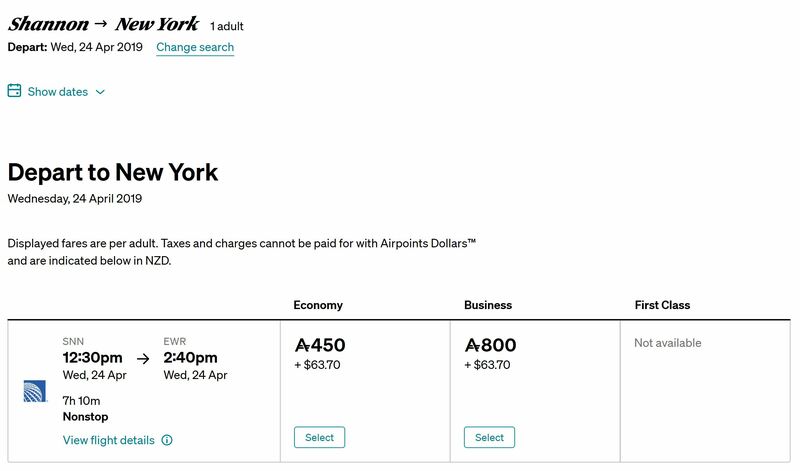 If you were planning to spend $470 on flights anyway, you’re effectively only paying $205 for the subscription itself— or about $3.94 per week. 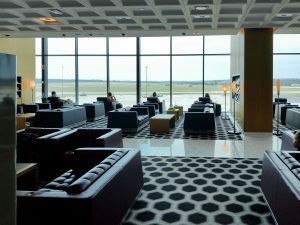 Remember that 1 Airpoints Dollar equals $1 NZD spent on flights with Air New Zealand, so if you travel frequently either domestically or Trans-Tasman, you’ll immediately be able to see the value you’ll receive back in ‘free’ flights. Alternatively, you could get even better value out of your Airpoints Dollars with a partner redemption— like the example shown below, where you could fly one-way from Ireland to the USA in United Airlines Business Class for only 800 Airpoints Dollars. If you have no interest in The Economist, keep your money in the bank. I cannot see any value in purchasing a magazine subscription just to earn the Airpoints Dollars. This is especially so when you could just buy Airpoints Dollars as needed using a Kiwibank Air New Zealand Airpoints credit card. However, if you were already intending to purchase a subscription, you should definitely take advantage of this high-value Airpoints Dollars earning opportunity. The ordinary online purchase price here for a subscription without bonus Airpoints Dollars is the same, so you won’t be financially penalised for taking advantage of the offer. Remember, if you purchase your subscription with a high-earning Airpoints Dollars credit card, you’ll earn even more. 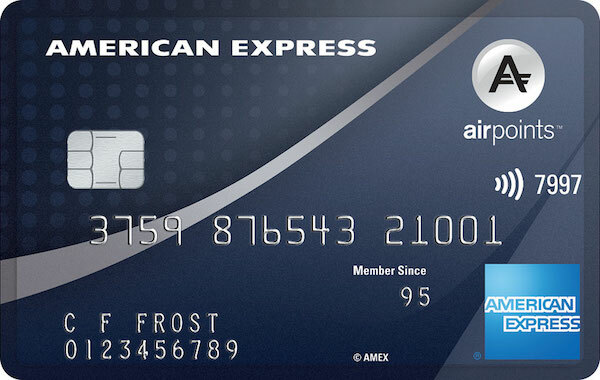 For example, using the American Express Airpoints Platinum will see you earn 1 APD for every $59 spent. This will boost your effective ‘rebate’ by 1.7%. While lots of miles/points programmes partner with The Economist to provide similar offers, Airpoints is the outlier where you can easily see how much value you’ll receive by taking it up. If you carefully plan your redemption, your subscription could end up effectively being free, based on the amount saved on flight cost. Note that it may take up to 8 weeks for the Airpoints Dollars to credit, so be sure you take this into account if you were planning to use the Airpoints Dollars in the short term. Will you take advantage of this offer? If so, what will you use your points on? have you got a link to the terms and conditions where it says its not for renewals? Hi Bob – it’s possible that this requirement may have changed, it was originally published as fine print on both the Air New Zealand and The Economist website, though now seems to have been removed. Though if you’re an existing subscriber and intend to rely on this offer, I would still recommend calling The Economist to make sure I haven’t missed something somewhere. You will need to maintain your subscription for a minimum of one year to keep the Airpoints Dollars (says this on the final checkout page). Thanks for finding that! Will update article.